FAME awards Camden National Bank with 2017 “Lender at Work for Maine"
Camden, ME, November 15, 2017 – The Finance Authority of Maine (FAME) presented Camden National Bank with the Lender at Work for Maine Award for lenders with over $1.5 billion in assets. This marks the 8th time that Camden National Bank has won the award, which recognizes the Bank’s commitment to supporting Maine businesses and jobs. The 2017 Awards were presented on November 14th during FAME’s annual Showcase Maine event at Holiday Inn by the Bay in Portland with keynote speaker Senator George Mitchell. 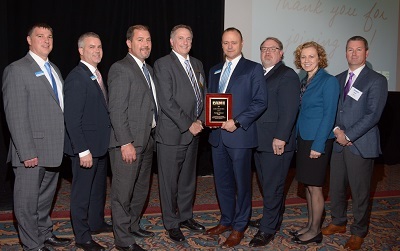 Camden National Bank was recognized as the highest volume commercial loan guarantee partner, having worked with FAME on 46 loans totaling over $17.3 million, creating 110 Maine jobs, and retaining an additional 435 jobs in the past year. Established in 1983, FAME works in conjunction with the lending community to support business development, start-up success, and scholarship assistance in Maine. The organization has a focus on workforce development and improved access to capital for business owners. At the awards event, FAME recognized Casco Bay Food and Beverage for the Business at Work for Maine Award, celebrating the largest loan insurance financing last year. Camden National Bank’s President and CEO, Greg Dufour, added, “Business growth, job creation, and community support have been company priorities since the Bank’s inception in 1875. We are honored to have FAME’s partnership and recognition again this year to ensure that successful loans be made in support of Maine businesses and people." With 60 banking centers and lending offices in Maine, New Hampshire, and Massachusetts, Camden National Bank has approximately $4.0 billion in total assets, $2.8 billion in loans, and $3.0 billion in deposits as of September 30, 2017. Camden National Corporation (NASDAQ:CAC), founded in 1875 and headquartered in Camden, Maine, is the largest publicly traded bank holding company in Northern New England with $4.0 billion in assets and nearly 650 employees. Camden National Bank, its subsidiary, is a full-service community bank that offers an array of consumer and business financial products and services, accompanied by the latest in digital banking technology to empower customers to bank the way they want. The Bank provides personalized service through a network of 60 banking centers, 76 ATMs, and lending offices in New Hampshire and Massachusetts, all complemented by 24/7 live phone support. Comprehensive wealth management, investment, and financial planning services are delivered by Camden National Wealth Management. To learn more, visit CamdenNational.com. Member FDIC.